How much speed could be shaved off of orbital velocity using the superdracos? If it was a substantial amount, wouldn't it reduce the loads on the heat shield quite a bit? It would take at least as much delta-v as the Falcon 9 second stage to significantly reduce the load on the heat shield. Even if you reduced the horizontal velocity, that would just increase the angle of attack and make the heat shorter but more intense. Then also, the superdracos have incredibly high thrust, but very low efficiency. if you follow other threads, especially the "can dragon land on the moon" threads, you'll find that the superdracos are not good for anything outside the atmosphere. So no, the superdracos are not useful to help the heat shield. OK, if helium is loaded PRIOR to LOX, it means helium is at ambient T.
I don't see why the helium would be at ambient. I would expect it to be super chilled, possibly below the LOX temperature and "warm up" to the LOX temp as it is being loaded. I don't see why the helium would be at ambient. I would expect it to be supper chilled, possibly below the LOX temperature and "warm up" to the LOX temp as it is being loaded. Do you not remember the Amos-6 F-9 exploding, destroying the pad, during a static fire? The cause is thought to be densified LOX, in the weave of the COPV, near its solidification point being frozen by colder Helium inside the COPV. Because supercooled (60K?) He in COPVs sitting in an empty, ambient temperature tank would warm, increasing the pressure with time or venting it as it warms. That doesn’t sound “quiescent “ or efficient. “The devil is in the details” and I hope we learn some of them. NASA’s Commercial Crew Program and SpaceX are finalizing plans for launch day operations as they prepare for the company’s first flight test with astronauts on board. The teams are working toward a crew test flight to the International Space Station, known as Demo-2, with NASA astronauts Bob Behnken and Doug Hurley in April 2019. Old news. This was reported by SFN no less than nine (9) days ago via an interview with Kathy Lueders. NASA and the rest of the media are slow in catching up. But that was the other way around wasn’t it? So if Helium can be loaded at normal cold temp, would the COPVs hold it stable while it warms up? It was a little bit more complex. LOX permeated the carbon fiber overwrap and filled cavities caused by buckles in the liner. Than two things happened: the supercooled helium caused the LOX close to the liner to freeze and the growing pressure inside the helium bottles caused the liner to expand. The frozen oxygen could not escape the same way it got in and instead got pressed against the overwrap. That was either enough to ignite the overwrap or it caused some fibres to rip which triggered the ignition. By pressurizing the COPVs before they are submerged in LOX, they won't expand when the LOX gets loaded. When it comes to Dragon 2 and its snazzy large-sized touchscreens -- how are these things able to stand up against the vibrations, shocks and stresses of space launch and re-entry? I'd imagine that such large thin screens (tablets?) would be particularly vulnerable to such forces. Are these primary control/viewing interfaces backed up by some kind of simpler and more rugged backup control scheme if they fail? Are these touchscreens the most modern choices available? Or could they one day give way to Augmented Reality (AR) projections on a spacesuit helmet visor? Glass is pretty crazy-strong, and they've been using it for fighter jets that are designed to pull repeated 9G+ maneuvers for several decades now. Your cell phone, with its wafer-thin panel, isn't representative of the best the world has to offer for toughness; they're optimizing for weight and thickness. Okay, but I'm presuming there are wafer thin tablet-style electronics behind that glass -- is that roughly accurate? Those could get rattled and disrupted during launch and lift-off. But I guess SpaceX would have tested against such conditions. Plus your touchscreens could get all smudgy during the course of a space mission - maybe some floating dirt could erroneously trigger a touch signal. I was also thinking that an AR-style mini-projection on a helmet visor might be the most compact, mass-saving and versatile solution. But I suppose there's the drawback of different personnel accidentally seeing different things when they're not all looking at a common viewscreen. They only wear the helmets during launch and reentry when there is nearly nothing to do since the vehicle is autonomous. What about the idea of a holographic projection display - or is that too exotic/weird? At least it would mean no physical screen that could suffer damage - or that you could accidentally bang your head into at the wrong moment. Could make for a roomier cabin. Not exactly sure where the state of that technology is at, however. I'm not sure what technology they are using for the displays, such as LCD or OLED, but they would be mounted on pretty rigid support structures, and there isn't much to move or rattle around. 30 years ago at a defense contractor I was at we were building plasma panel displays with touch screens for upcoming Navy ships (yes, 30 years ago). 4" thick and you could drop them off of a table and they worked fine. In fact the contract called out for testing each display on a vibration table since these were going in ships that were expected to be in battle. When dealing with vibration, it's eliminating things that move that is important, and there is not much to move on displays. 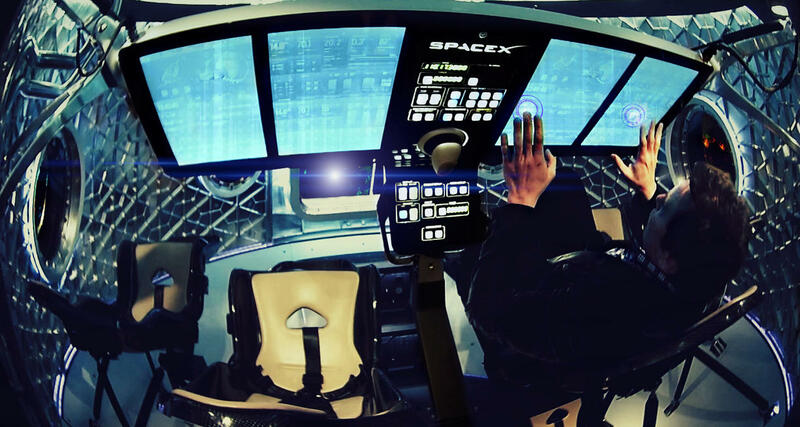 Regarding the computers, SpaceX already has experience with redundant computer systems on the Dragon Cargo, and those use commercial technology - which can be pretty durable. Also, if you watch the Soyuz capsule launches, they are pretty smooth, and I would expect a Dragon Crew to be a fairly smooth ride too. Likely each display is on it's own independent system. That means you have to wear the helmet the whole time, and only you can see what is on the display. I don't think that is as flexible as displays that everyone can see and use. None of the above are really of major concern. The very first touchscreens were for CRTs, and those are very robust to resist the forces against it from the vacuum inside. The electronics themselves can be arbitrarily robust. Okay, but a large enough screen is going to have some flexion, and should be affected by vibration, shouldn't it? The vibration and forces during launch and re-entry should be assumed to be extreme. In that image with Musk I posted above, I guess it does look at least a few inches thick overall. Projection technology allows you to achieve a large viewing surface area, without worrying about any resulting flexion or vulnerability due to size, since the viewing surface is effectively "dumb", and perhaps can even be an ad-hoc/improvised one. ...and should be affected by vibration, shouldn't it? The vibration and forces during launch and re-entry should be assumed to be extreme. Liquid fueled engines don't have as much vibration as solid fuel engines, and as I pointed out the Soyuz flights are pretty smooth. Why do you think there will be a lot of vibration during normal ascents? As to landings, I'm not sure what causes major vibration (or that it's a thing to be concerned about). Anyone want to chip in with some actual data on this? They would have the display shock mounted in the enclosure, and the enclosure likely also allows the displays to operate in a complete vacuum. Problem with projection displays is that what if something gets in the way of the projection, and what clean surface are they displaying the information on? I think SpaceX thought through all of the alternatives, and what we see today is what they think was the best solution. The vibration and forces during launch and re-entry should be assumed to be extreme. SpaceX likely has Gigabytes of launch and reentry G force data from their past Cargo Dragon fights they have flown. Well, there could be shock type forces too - don't you have to overdesign against these possibilities? What about air turbulence too? You don't want something to break while passing through Qmax, and then not work for the rest of the trip. I'd read some people complain of high G-forces during Soyuz re-entries -- being bumped around a lot. Fair enough, but I wonder just how stress-tolerant it is, though. Well, if it's an ultra-short throw projector, then hopefully nothing gets in the way. Also, if it's a rear-projection, then it's further out of the way. A dumb surface like a projection wall, screen, or glass pane could be very strong, to easily withstand any shocks or vibration forces. SpaceX seems to use a lot of consumer-grade technology in various places. Hopefully it would stand up to the rigors of spaceflight. It's just that Dragon 2 was unveiled more than a few years ago, and A/V technology has advanced since then. I'am pretty sure SpaceX (and Nasa) are already aware of the shock loads they are likely to see and have tested their kit on the ground to match and even exceed this. Neither are new kids in this game and have tons of data to go test against. Are we all worrying about something that doesn't need to be worried about? Given that you can buy COTS touchscreens made for use in off-road racers (Baja etc.) for under $1k, yes.